Texan Beto O’Rourke has topped a new poll as the most popular choice among Democrats to challenge Donald Trump in 2020. He narrowly failed to win the senate seat of Republican Ted Cruz last month but his charismatic campaign has raised his profile. In the poll, he came in first with 15.6 per cent, followed by Joe Biden at 14.9 per cent and Bernie Sanders 13.1 per cent. 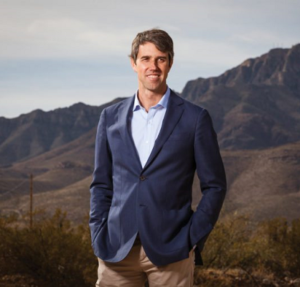 O’Rourke was born 26 September 1972 El Paso, Texas, into a family with political connections and after a muddled early adult life including a stint in a band, he settled down to a steady job, served on the city council and then became a congressman. He is an exceptionally determined and confident Sun Pluto in Libra conjunct Mars in late Virgo, all square Jupiter in Capricorn. His Saturn in Gemini is square Mars and which will make him hard-working, short-tempered. His Saturn is also trine Uranus, sextile Venus in sociable Leo – innovative, charming, a good networker. 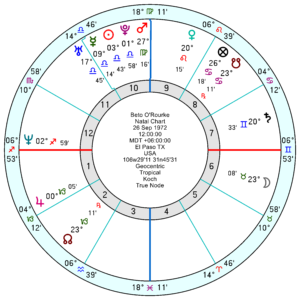 What will stymie his chances in 2020 is tr Neptune square his Saturn from late April onwards which is uncertain, confused, perhaps a scandal popping up. 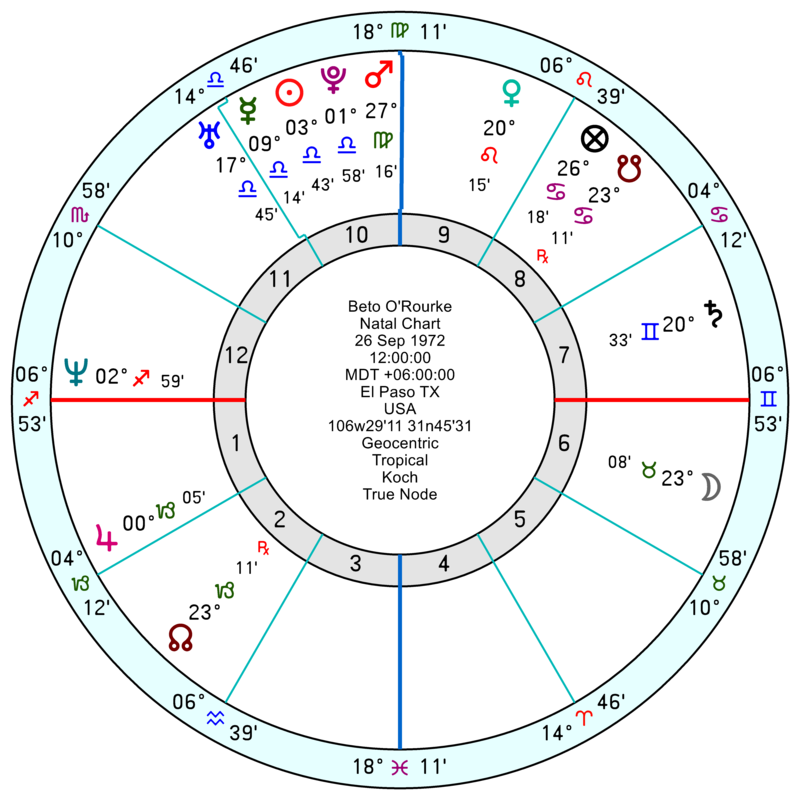 And from late May 2020 tr Uranus starts to square his Mars/Saturn midpoint which suggests rolling crises. Both these influences run into early 2021. He has said he doesn’t intend to put himself forward in 2020 though presumably if the pressure is there he might give in. But he’d be wise to stay out. His chart doesn’t look too bad over the election and immediately afterwards, with the Jupiter/Saturn conjunction in Aquarius trining his Libra Sun. Aspects don’t look too bad over the inaugural period either. Bette Midler recently tweeted support for a Biden-Beto ticket (presumably with Beto as the VP candidate). Would you see anything in that, Marjorie? Beto would backdoor his way into the presidency, as old as Biden is. Anyone see this in Beto’s chart…. As a Democrat myself….I will be happy with ANY Democratic candidate in 2020…except Bernie Sanders (and I’m pretty sure that little trouble maker is going to run again). I will NOT vote for Bernie Sanders in the primaries – I can’t stand him. I would even vote for Elizabeth Warren (who isn’t my top choice…but at least she is a REAL Democrat and she does what our Democratic Party expects of her [she does act little weird sometimes, but she’s still better than Sanders]) in the Democratic primaries before I’d EVER vote for Bernie Sanders. Fortunately, in 2020, California and Texas (two states Sanders doesn’t have a chance of winning) will be voting first in the primaries instead of White and rural Iowa and New Hampshire. And California and Texas are the two most populous states and have A LOT of pledged delegates. So, that should be enough to force Bernie Sanders OUT of the primaries pretty early. Anyway, now that I’ve said what I needed to say about Sanders, I’ll get back on topic. I actually thought Beto O’Rourke would be strong candidate in 2020 because he’s very popular with young people and the media loves him. I haven’t decided on a candidate for 2020….but I’m leaning towards Kamala Harris, Cory Booker, or Steve Bullock. I feel any one of them would be strategic. Plus, they’re more “moderate” Democrats – which would resonate with more of the general population. So…do you see happen to see Democratic candidate with a strong enough chart for 2020? How about Kamala Harris? Or…how about Steve Bullock? A scandal should be somehing that hasn’t happened yer, since he ran against Ted Cruz, the original Mercer candidate and Bannon/Cambridge Analytica client for 2016 in Texas, and nothing emerged. But I suspect he’ll ultimately be “too nice” for Democrats in 2020. While I hear comparisons to Kennedy(s), I think there is a lot of fellow Libran Jimmy Carter in him. I personally like Carter, but he was almost too decent, a reaction to Nixon I guess. But if Trump runs (I personally think he won’t be able, and this is one of the reasons Republicans are MIA), Democrats need someone like Pelosi to put him in his place in debates. Also, the way things are going Worldwide, The US public might notice they actually need someone strong in Foreign Policy. I agree with your assessment. I feel we need a candidate who has more experience and someone who is more strategic. I like Beto O’Rourke and I’d have absolutely no problem voting for him in the general election if were the nominee. However, I personally think he would be a much better candidate to run for the U.S. Senate again in 2020. Texas’s Republican U.S. Senator John Cornyn will be up for reelection in 2020…and I heard there were rumors that he’s considering retiring. If so, that would mean an “open” U.S. Senate seat…and Beto O’Rourke would have a much better chance of winning it because there would be no “incumbent” (incumbents can be hard to beat). That’s certainly what happened in Arizona with Republican Jeff Flake retiring; Democrat Kyrsten Sinema was able to win that seat this year. I think a “red state” Democrat (one who has had electoral victories) would be a good choice for 2020. For example, I heard Montana’s current Democratic Governor Steve Bullock is considering running. Montana is a Republican state in presidential elections….however, Bullock managed to win two terms there. Perhaps he would be a strong Democratic candidate who could galvanize more support in the Mountain West and Midwestern states. The Texas Republicans dug up scandal about Beto during the Cruz Crusade. Two arrrests: a DUI and a Burglary charge. Made light of by him during his counterpoint, but not something to be proud of. Not “nice”. The astrologer mentions he has a hot temper. Could see some acting out in the future…. What about Julian Castro? He’s about to officially announce his candidacy. Castro is interesting in that he has an identical twin brother. I can already see all sorts of soapopery developments here. Castro seems to be born in September 14, so not Neptune free. Actor Rami Malek has an identical twin. His twin is more muscular and of a normal weight, while Rami is thin. Easy to tell apart. It’s the same with The Castro twins. Joaquin is noticeably heavier. I got a psychic nudge when Julie mentioned him. With the primaries starting in Cali and Texas, he may catch a wave of latino votes that will make him the front runner. His mom is a well known Chicano activist, and can get the vote out in the community.